What’s yuzu? Good thing you asked! It’s a very tasty variety of citrus found in Japan and also a slightly different variety exists in Korea. The funny part is, it’s almost inedible as it’s full of seeds and has very little juice. What it is prized for though is the incredibly fragrant zest. Used for accents on everything from fish to noodle dishes, or combined with spicy green chili peppers, and salt to create yuzukosho, a delicate, yet spicy condiment favored as a sparing addition along with wagyu or other meats on the plate when served. Then, there are the myriad of frozen and other sweets specifically prepared as yuzu flavored, and spiked with tasty little bits of the zest throughout. 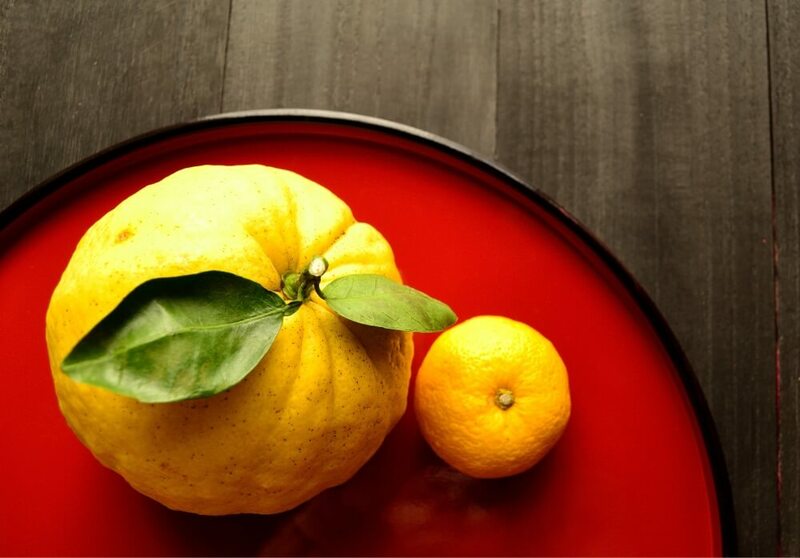 About the size of a tangerine, the truly unique flavor of yuzu is commonly described as a mashup of Meyer lemon, mandarin orange and grapefruit. The most common way of using fresh yuzu is usually thinly julienned slivers of the brilliant yellow zest to garnish Japanese cuisine or accent noodle or hot pot dishes. Another popular use for yuzu is yuzu-cha or yuzu tea. Actually more of a marmalade, it’s often enjoyed hot, by simply mixing with hot water. Yuzu-cha is made in a few different ways. 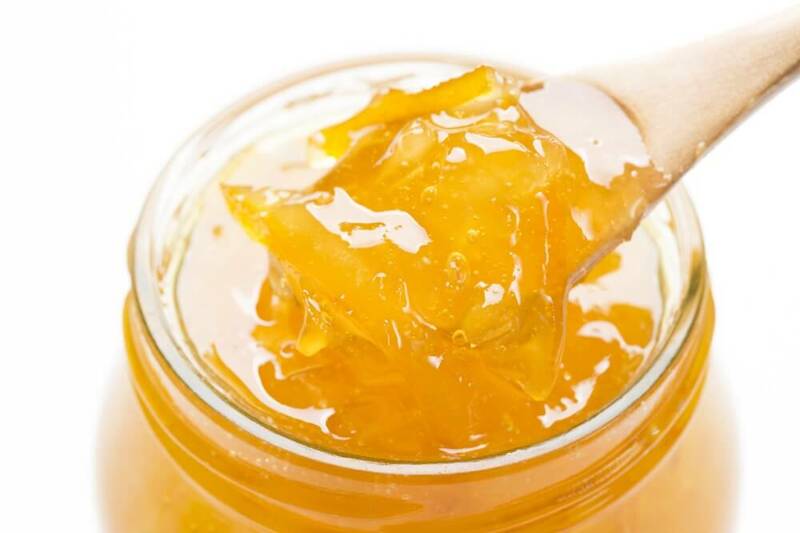 One of the most common is to replace oranges and make a traditional marmalade recipe. Another shortcut method for preparing yuzu-cha, which requires no cooking, and just a little patience is macerating julienned yuzu in honey and its own juice. The method can be quite tedious as it’s necessary to remove all of the seeds first. This is most easily accomplished my cutting the fruit in half between the stem and blossom, then using a fork to remove all of the seats… and there are many! Once seeded Cut the halves into quarters and then thinly slice into strips. Be sure to catch all the juice, as minimal as it may be. Place the sliced fruit into a plastic refrigerator container which has a cover. Completely cover the sliced yuzu with honey until all the gaps are filled. Place the lid on and refrigerate for at least two days. The longer you let it sit the more the honey and juice will break down the yuzu. There is also one more, non-culinary use for yuzu that is absolutely sublime. A few fresh clean yuzu with the outer zest just pricked slightly and floated in a hot bath will take relaxation to a completely new level. This comes from the D-limonene found in the peels of citrus and has the unique combination of improving clarity while having a calming effect on the body. When in season yuzu can be found in most supermarkets. They are grown commercially in Shikoku and Kochi Prefecture, hut can be found almost anywhere in Japan. A better bet is to travel to the countryside and visit a farm cooperative store or an orchard and pick your own. 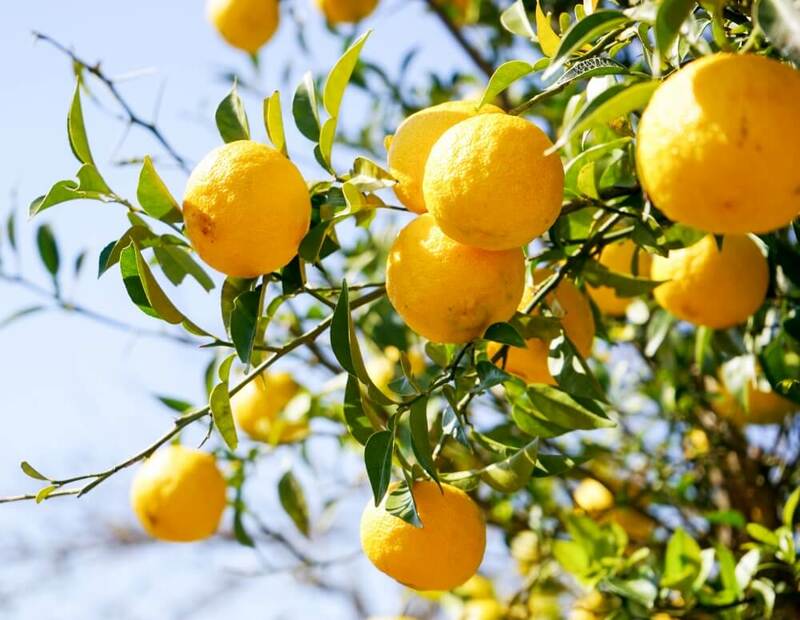 Yuzu are usually available from November and December when they ripen. Planning your own trip to Japan? Join a food tour and discover the exciting seasonal flavors and traditions that have made Japanese food world famous.